DESPITE world attention on the Commonwealth Games, parishioners at Surfers Paradise have been taking a mass influx of athletes and visitors all in their stride. Surfers Paradise is one of the largest Catholic parishes in Australia and many locals were finding it eerily quiet as they braced for a Games influx, with Carrara Stadium – the main athletics venue – in the heart of their parish. 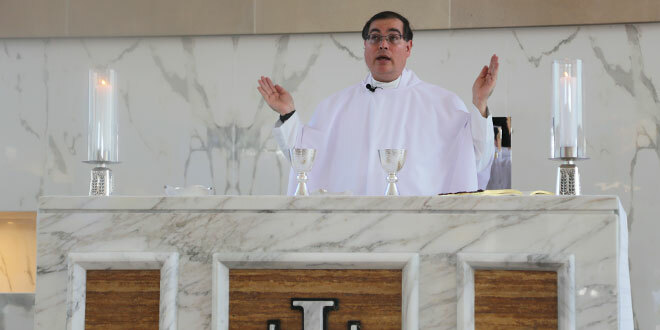 “We feel we are in the eye of a very friendly storm,” assistant pastor Fr Paul Kelly said at Mass at Stella Maris Church, the morning after the Games opening ceremony. The reason for the quiet, was that most main roads towards the centre of the Gold Coast were blocked for security checks with traffic diverted, and Games visitors advised to take public transport to get to their destinations. It felt even quieter, one parishioner, John, said because many locals had used the Games as an opportunity to go on holidays “either interstate or to Bali”, just to beat the expected disruption. But that wasn’t stopping crowds of spectators cramming on to trains, buses and trams. The beaches were abuzz, the main streets in downtown Surfers Paradise were overflowing, and the tram ride to get there was packed as spectators, ate, drank and made their way to the sports venues across the Coast. Fans packed the towering scaffolded stands at the Gold Coast Aquatic Centre in Southport. They also lined Southport’s Broadwater Parklands to cheer on triathletes belting along the city streets. 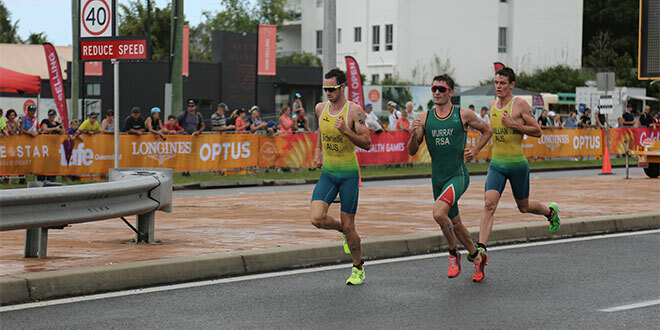 Triathlon: Fast-finishing Australian triathlete Jacob Birtwhistle strides towards Commonwealth Games silver, while South Africa’s Richard Murray and Australia’s Luke Willian follow closely behind. Photo: Mark Bowling. At parish headquarters – Clear Island Waters Catholic Centre – parish priest Fr Peter Dillon had logistical matters in hand, but there were always going to be a few hiccups during the Games. He discussed with Fr Kelly how some of the events would likely affect church business. For a start, the regular route for funerals from Sacred Heart Church to a nearby cemetery – usually a short drive past Carrara Stadium – would have to be diverted, possibly a fair distance along the M1 motorway. And a decision had already been made not to hold two morning Masses on the final Sunday of the Games, because the route for the marathon would run right past the front doors of Stella Maris Church, Broadbeach, as athletes pounded along the beachfront. That would make it difficult for many parishioners to get to church, certainly impossible to park their cars. 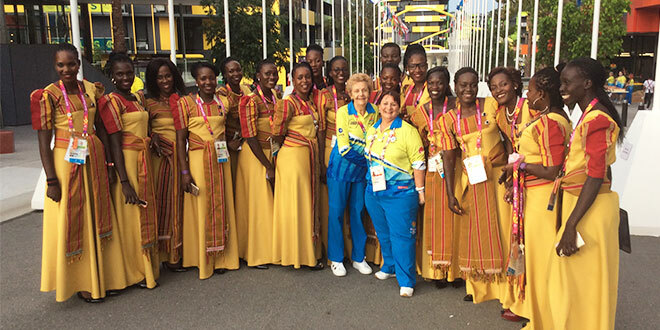 Ugandan woman athletes, dressed for the Commonwealth Games opening ceremony, with Catholic chaplain Helen Day (centre left) and Buddhist chaplain, Carol Hogarth. Photo: Supplied.